MURAD SAYS - "A dual-action foam cleanser that deep cleans to remove dirt and oil as it tightens pores without over-drying leaving skin feeling balanced." Hey, it's Layla - I'm back with a new beauty post! 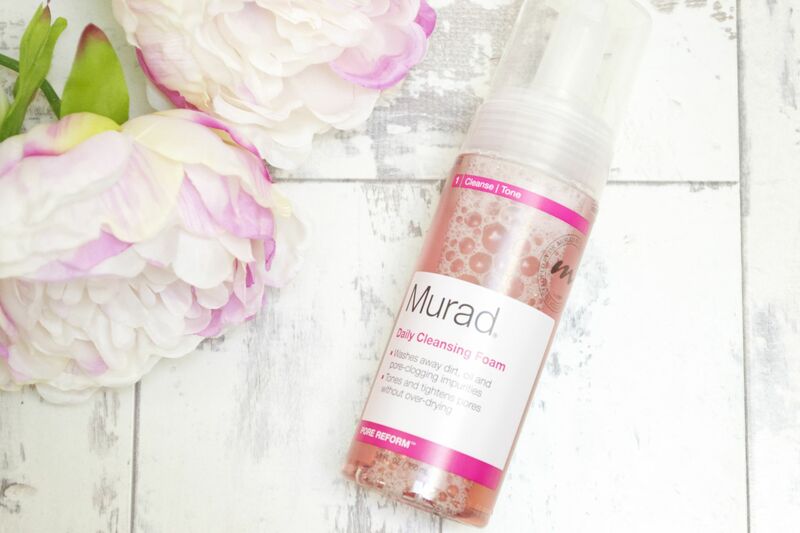 You all know that I love sharing my skincare products with you all and in this post, I'm writing about the Murad Daily Cleansing Foam which is a must-have for everyone. I've been using Murad Skincare for a few months now and I can honestly say that my skin has never looked better - below, you can see all the details from the packaging to the formulation and also find out about how your skin can benefit from this must-have product. Murad is a brand that lets their products do the talking - they don't need fancy packaging and it's actually rather refreshing to see a brand like this. As you can see, the packaging is simple, sleek and classy looking with a professional feel. All the relevant information is displayed on the front and back and the brand has also used complimenting colours which let you know what range the product is from. Inside the packaging, there's another lovely touch with quotes (as seen in the image on the left) - this is a really lovely addition and something which makes the brand stand out from others. The Murad Daily Cleansing Foam is as described - a foam. As you can see, the applicator is a pump-applicator which turns the liquid into a foam which also means that the product itself lasts longer as less product is needed when the liquid turns into a foam. One pump of product is all you need for your face and neck. I tend to use this in the morning to refresh and rejuvenate my skin so it's ready for the day ahead - in the evening, I use the Murad AHA/BHA Exfoliating cleanser which is a lovely pampering product and perfect after a long day to boost skin. To use the Murad Daily Cleansing Foam - follow these simple steps below. Gently dry skin with a face towel and follow-up with an oil-free moisturiser or Vitamin C Moisturiser. This is a dual-action foam cleanser which not only cleanses but gently exfoliates the skin with AHAs leaving your skin soft, smooth and feeling hydrated. With key ingredients such as Witch Hazel and Copper Gluconate - this removes any excess oil without stripping your skin of it's natural moisture leaving it looking hydrated, plump, healthy and glowing. Below, you'll be able to find the official links to the UK and US Murad Skincare website. Priced at £26.00 for UK shoppers and $30.00 for US shoppers - this isn't expensive when you see the benefits of the products from the first few uses. I love Murad Skincare - they're a brand that really know their skincare products with different ranges targeting different skin types. After using their products for a few months now, I can honestly say that I've seen such a difference in my skin and it's by far one of the best brands out there in relation to looking after and maintaining healthy skin. If you're someone who suffers with breakouts or acne - I definitely recommend checking out Murad as there's something for everyone no matter what skincare problem you're suffering with. If you're unsure with what product to choose then contact the customer services team who'll be able to guide you and help with their expertise. Let me know what you all think - have you used Murad or seen any products that you want to use? What a cool product! I love cleansing foams. I really enjoy using Foaming cleansers! This sounds like a great option. I’ve always wanted to try Murad products before! I do need a new face wash soon. I’ll look into this!